Now the newest bounties are listed in the end of the list of bounties. I propose to reverse the order, and show newest bounties in the beginning of the list of bounties. This way newest bounties would be drawing attention as soon as they arrive. It would, in my opinion, decrease the average response time to a bounty. Quicker answered bounties = better for bounty authors. On sites which use the new navigation bar, you can sort bounties per tag by "newest"
Not the answer you're looking for? 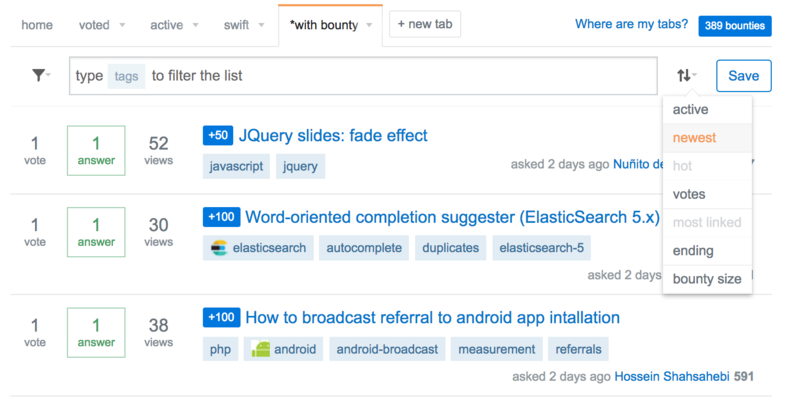 Browse other questions tagged discussion feature-request bounty active-bounties .